By default Accordion allows only one panel to be in expanded state. You can enable multiple panels in expand state by setting EnableMultipleOpen to true. The following steps explains you to enable multiple panel for Accordion. In an ASPX page, define a <div> element that is a container for Accordion control and add the contents correspondingly. 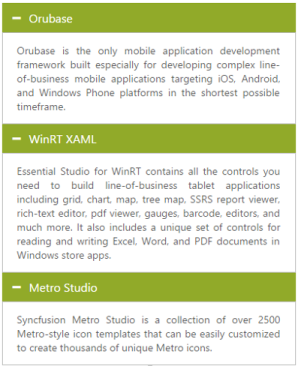 Orubase is the only mobile application development Framework built especially for developing complex line-of-business mobile applications targeting iOS, Android, and Windows Phone platforms in the shortest possible time frame. Essential Studio for WinRT contains all the controls you need to build line-of-business tablet applications including grid, chart, map, tree map, SSRS report viewer, rich-text editor, PDF viewer, gauges, barcode, editors, and much more. It also includes a unique set of controls for reading and writing Excel, Word, and PDF documents in Windows store apps. Syncfusion Metro Studio is a collection of over 2500 Metro-style icon templates that can be easily customized to create thousands of unique Metro icons. Following screenshot is the output for Accordion control on EnableMultipleOpen set to true.